Sign up for Broadjam today to follow k'annibal woman, and be notified when they upload new stuff or update their news! This latest release from K'annibal Woman is a solid and consistent CD from start to finish. Its strength - the raw song for song intensity that keeps coming at you. No doubt these guys are a total riot to check out live. The music is nitty gritty, yet heavy and consistent. Like a heavy weight fighter this CD packs a powerful punch and goes the full 12 rounds with no sign of letting up. Like a 1-2 punch the song keep coming at you, one after the other until you're ready to tap out. The messages are intense and beware this CD may cause your ears to bleed. 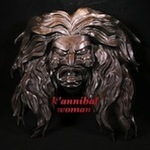 Overall this latest CD from K'annibal Woman packs a powerful punch and takes no prisoners.